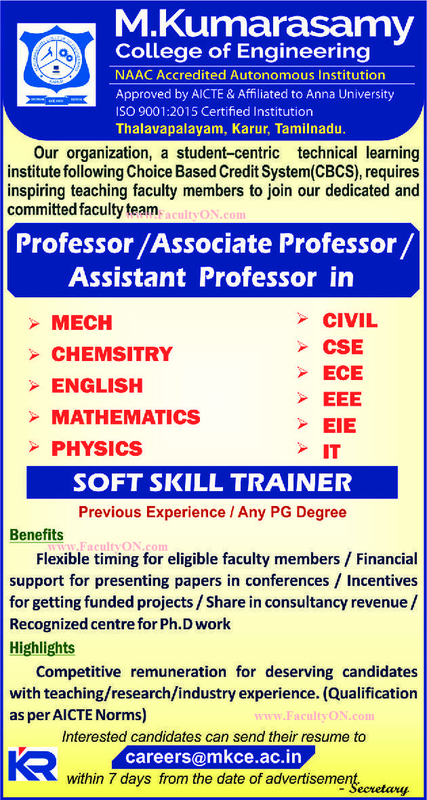 M.Kumarasamy College of Engineering, Karur has advertised in THE HINDU newspaper for recruitment of Professor / Associate Professor / Assistant Professor Plus Non-Faculty jobs vacancies. Interested and eligible job aspirants are requested to apply within 07 days from 18th April 2018. Check out further more details below. About College: M.Kumarasamy College of Engineering established in the year 2000 by M.Kumarasamy Health and Educational Trust with a vision to provide technical education for all sections of the society has made rapid strides on all fronts to achieve academic excellence in a short span of time. How to Apply: Interested and eligible candidates are requested to send their Resume in soft copy along with scanned copies of certificates and recent PP size photo to the email address provided below.